This beautiful musical ring box from our own range 'The Music Box Shop', is fitted with an 18 note musical movement. The music box is wound from underneath. When you lift the lid the music plays. 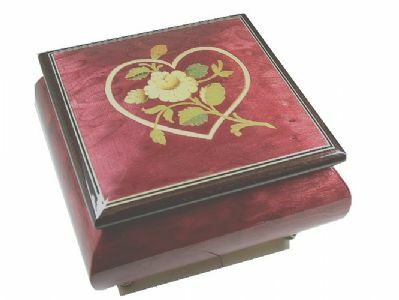 The box is in a rose red veneer and inlaid with a heart and flower design. 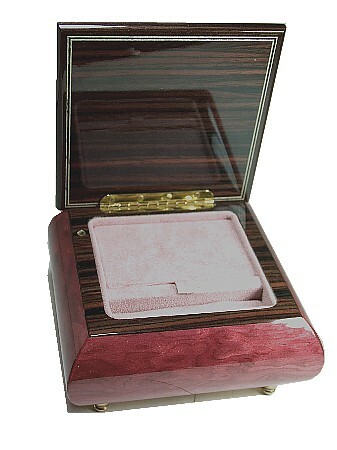 This musical ring box is finished with a gloss lacquer. Approx Size :112mm x 112mm x 60mm. Please note - although we take as much care as possible to show pictures of the actual range of products available, because this is a hand made product, the designs & colours may naturally vary slightly from those shown.